Kick the winning goal with Football Star slots! Football Star pokies is a 243 way to win pokies game with heaps of rewarding bonuses in a high action slot. 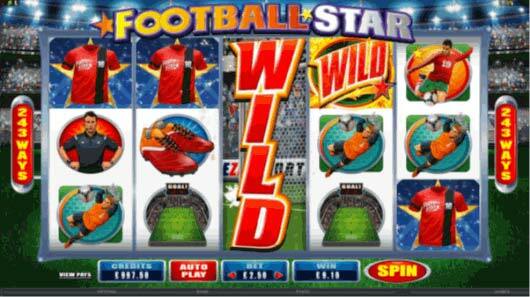 This slot is themed on soccer with football scatter symbols, referees, players and other soccer themed symbols. There are many bonuses ensuring this game has a high payout ratio. Whether your favourite code is soccer, AFL or NRL Rugby this game will bring out your inner sporting competitor. Reels 2, 3 and 4 can turn wild at random with a win guaranteed. You can also win through the free spins mode which is triggered when 3, 4 or 5 of the soccer ball scatters land on any payline. This game features the rolling reels whereby a winning combination symbols will blow up bringing down more symbols for an extra chance to win. Football Star slots is truly one of the best sporting pokies available on the internet. With stunning colourful and crisp graphics and game play that will keep you playing for hours. Enjoy on desktop PC download or free pokies apps.